Finnish sailing yacht specialist Nautor’s Swan has announced the sale of the second unit of its Swan 98 superyacht series. 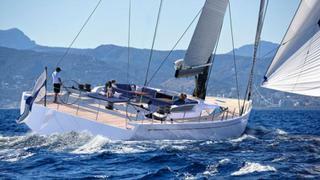 Designed by veteran Swan designer German Frers, the 30 metre yacht design was unveiled in May. The yard announced during the Monaco Yacht Show in September that construction had begun on the first Swan 98, with a projected delivery of June 2020. The Swan 98 includes a number of customisation options that mean no two Swan 98s will be the same. One key opt-in feature is a telescopic keel which reduces the draught from 4.9 metres to 3.2 metres, allowing owners to enter shallower reefs and harbours. Frers’ design includes a flared stern and hydraulically powered transom, which reveals a teak-decked swim platform and garage for a tender measuring up to four metres. A full beam engine room will sit below the raised saloon, providing access to the yacht’s 279hr Steyr main engine. 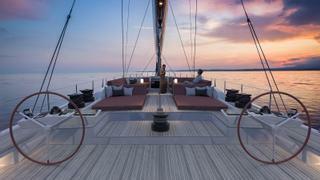 The yacht will also feature twin helms aft, a square mainsail and double length bowsprit. Italian architect Misa Poggi has been handed the interior design brief, which includes two potential layouts and three interior themes; timeless classical white, traditional navy and ‘Wine Cowes’. All feature Italian textiles and leathers. An additional fourth interior theme has been created in-house by the Nautor's Swan design team. It attempts to capture a Nordic atmosphere with a ‘Spirit of Finland’ theme. Three ensuite guest cabins – a double and two twins, complete the accommodation for eight people. The crew quarters will include two twin en suite cabins for a staff of up to four people.